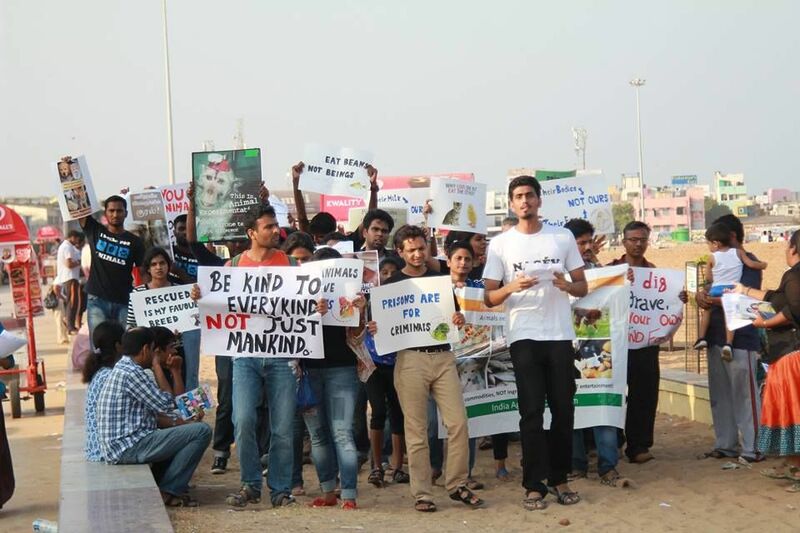 On 20th March 2016, a Sunday, around fifty of us animal lovers gathered at the Besant Nagar beach, Chennai. We marched to create awareness on cruelty towards animals, and to begin the liberation of animals from human tyranny. Yes, you read it right – HUMAN TYRANNY. This march happened not just in Chennai, but also in seven cities across India at the same time. I guess the planning & organizing happened mostly on Facebook. Since I have some friends who are members of Vegans in India/Chennai Facebook groups, I too got intimated about this event and decided to go. What better way to spend a Sunday evening? Special thanks to Preethi Raghav. The objective of the march was simple: To try and convince people on the merits of veganism (people who don’t eat meat and diary products), in order to end the cruelty meted out to countless animals across the world by the meat and diary industry on a daily basis. And to keep oneself healthy. Initially, we held placards and marched throughout the length of the beach. We raised slogans in English and Tamil. We had obtained police permission for this march. Then we split into groups and went to talk to a few people directly. Since I didn’t know much on this topic, I attached myself with different groups of volunteers and observed what/how they spoke. I should say they were highly convincing. At the end of the day, I didn’t have any doubts or inhibitions about this cause. I am not a vegan yet as I am finding it difficult to avoid curd and ghee. Milk, I take in limited quantity (one cup a day) which I won’t have much problem avoiding also. I am trying. Sometimes I eat sandwiches, sweets, ice creams, chocolates, etc. that are made of milk. But if you think about it – most of these items are unhealthy, so it’s easy to avoid. The next time some milk-based food is presented before me, I am bound to think twice before eating it, if at all. I think it’s important for me to support worthy initiatives like this. Not only for the liberation of animals, but also for a healthier me. PS: 1. This march was covered by Indian Express; 2. A fellow volunteer’s blog post on this event. Wooow! Wonderful Good See in Chennai providing awareness on Animal Cruelty. I would like to Join with you. You can join our facebook group ‘Vegans in Chennai’ where an announcement is made when events are organized in Chennai.